This is my second attempt at writing this post. The first time, in a quest for ‘objectivity’, I got bogged down in a treacly mix of scoring apps against criteria that were of my own choosing anyway. This time around I am opting for an unashamedly impressionistic approach: these are the task management apps I like best. They are all compatible with David Allen’s Getting Things Done® (GTD®) methodology, capable of supporting basic to complex project management and with at least one mobile app (iPhone or iPad, ideally both). Despite meeting those criteria, Things, asana, FacileThings and several other pretty solid apps did not make the grade. Only ten apps will fit into a top–10 after all (I was reasonably good at maths at school). My ranking is exactly that: a personal top ten, reflecting my preferences (I like a nice UI), my approach to productivity (David Allen’s GTD®), my hardware (I am a Mac user), my needs (as a sole operator I have no need for team collaboration features or enterprise–based software) and my experience (I have tested ~30 task management apps over the past two years). In my previous post I introduced you to IQTELL’s virtual workspace, which brings together all your calendars, email accounts, contact information, tasks and notes into the one gargantuan browser-based application. 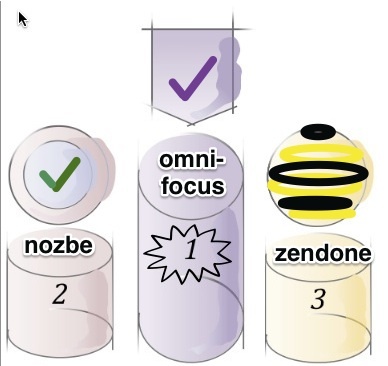 setting up a GTD workflow: evernote or zendone? GQueues is an attractive and powerful online task manager that integrates with your Google account. Its colourful and easy to use interface is built around folders that contain lists of tasks (called ‘queues’). You can drag and drop tasks, tag them and add notes or due dates. GQueues is highly customisable and can be set up to support a Getting Things Done™ (GTD™) workflow. what do you want from a to-do app? Fools rush in, they say, where angels fear to tread. I thought I would create a diagram, using XMind, a free mind-mapping program, to ‘shortlist’ selected task management programs from a couple of user perspectives. There are no winners: most of the listed apps have the capacity to boost your productivity enormously. Choosing a productivity app is largely a matter of personal preference – you have to feel comfortable with how data are entered, with the views on offer, with the workflow and the colour scheme. Some of that takes time; an app that dazzles you in the first week may feel suffocating and uninformative once it needs to handle a couple of hundred tasks. You can question many aspects of my diagram. For example, most of the listed apps support various degrees of customisation; I have only listed omnifocus, gqueues and toodledo as being extraordinarily versatile in that area. For ‘bug free’ I have set the bar equally high. There are also gaps in my diagram. I have not included apps that I have never explored (call me traditional), nor apps that are primarily geared towards note taking (such as evernote, that swiss army knife of productivity) or team collaboration (such as basecamp or flow). I have not included other parameters, such as whether file attachments are supported. There is only so much that will fit on a page. My aim in posting this is not to provide complete or authoritative advice, but to provide a couple of pointers for people who are trying to find a task management app that may work for them. I would appreciate constructive feedback! Today marks the launch of new desktop versions for windows and mac of the nozbe productivity app. This post is a fully independent review of version 1.00 of the mac desktop version, which I am running on os 10.7.3 (lion). Nozbe is the brainchild of michael swilinski of apivision, whose website describes the software as a ‘web-based time- and project-management application for busy people and teams’.